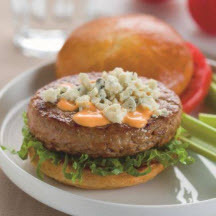 A zesty Buffalo-style sauce and blue cheese give these turkey burgers a flavor twist you're sure to enjoy. Preheat grill to medium direct heat. Butter cut surfaces of buns. Toast, cut side down, on grill until light golden brown; set aside. Grill turkey burgers according to package directions. Divide shredded lettuce evenly over bottom of hamburger buns. Top each with tomato, turkey burger, Buffalo sauce and Blue cheese. Cover with top of bun and serve.